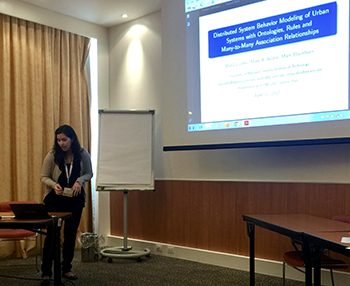 Maria Coelho presents the paper at the 12th International Conference on Systems. "Distributed System Behavior Modeling of Urban Systems with Ontologies, Rules and Many-to-Many Association Relationships," a paper by Ph.D. Student Maria Coelho (Civil Systems), Associate Professor Mark Austin (CEE/ISR) and Research Associate Professor Mark Blackburn (Stevens Institute of Technology) has won the Best Paper Award at the 12th International Conference on Systems (ICONS 2017) in Venice, Italy. The authors also are being invited to submit an extended version of the paper for journal publication. The winning paper is a “work in progress,” describing a new approach to behavior modeling of large-scale urban systems with combinations of ontologies, rules and message-passing mechanisms. The authors are exploring ways in which city behaviors can be modeled as networks of domain-specific networks and, in particular, how failures in one urban domain might cascade to other domains. "Modern urban infrastructure systems comprise physical, communication and social networks that are spatially distributed, and defined by concurrent subsystem-level behaviors, distributed control and decision making," says Austin. "Our near-term goal is to devise models of urban behavior that capture the essence of interactions among urban domains, and then use those models to plan relief actions in response to a loss of functionality." This work is supported by a grant from the Systems Engineering Research Center for research with NAVAIR: Transforming Systems Engineering Through Model-Centric Engineering.